Ten days have passed since my last post, and I wanted to reassure my readers that I haven’t been struck down by swine flu or a runaway Mack truck. I’m alive and well. You haven’t heard from me for one plain reason: nothing is happening. Sure, the Winter Olympics are under way in Vancouver and its environs. A disgruntled female college professor allegedly went on a fatal rampage in Alabama. A dozen Afghan civilians were terminally inconvenienced by an errant American missile. Senator Evan Bayh of Indiana announced that he wouldn’t run for another term, citing chronic partisanship in our legislative branch. I feel his pain. Perhaps Bayh gave up because nothing is happening where it really matters: untying the knots in healthcare reform… creating jobs for victims of the financial crash… curbing the fearsome federal deficit… imposing reasonable controls on Wall Street… stripping powerful lobbies of their ability to buy elections and dictate public policy. If anything, the entrenched interests that continually thwart the public will are entrenching themselves more deeply and defiantly. Right now the most powerful person in the United States isn’t President Obama or even Oprah Winfrey. That honor goes to Lloyd C. Blankfein, CEO of Goldman Sachs and unacknowledged Master of the Universe. This is unnatural and wrong. Right now the leader of the free world is bowing not only to foreign potentates of dubious merit, but to sinister ambassadors from the banking and pharmaceutical industries. What to do? Enjoy the Olympics, go sledding in the snow, light a fire in the fireplace and toast some marshmallows until they’re evenly tanned. This difficult winter will eventually pass, so we might as well take some pleasure in it while it lasts. Bad times don’t have to make a bad life. You’re probably right, TK. Obama should start going with his gut, short of promoting lefty-fringe ideas like widespread nationalization or reparations for African Americans. We really could use a few FDR-style public works programs right now, along with sweeping overhauls of both Wall Street and corporate America, but Obama won’t propose them because he’s afraid of drumming up more animosity on the right. He definitely needs to act more decisively. I’d trust Obama’s gut over George W. Bush’s gut. I completely agree with you on the issue of decisiveness, Rick. I sometimes have to remind myself that the whole point of having a two party system is that the two parties stand – or should stand – for different perspectives on how best to run our democratic society. Disagreement and debate should be encouraged and respected, an attitude that, as you have pointed out more than once, is sorely lacking in our current environment, replaced by fear and anger and hatred for those who think differently. Politics has always been a dirty business, but it seems that, more and more, politics has supplanted statesmanship and leadership at the highest levels of government, and that is scary. I don’t know that I would much like Obama’s gut instincts , but I would like to see him take a clear stand on what he believes is the best direction for our country, stop campaigning for “change” and “transformation”, and start being more specific about how, specifically, he would like to change and transform this country. I’d like to know where he wants to lead. Just saying that we must “reform” healthcare is not enough. And claiming that the only alternative is “doing nothing” is a straw man argument. I am honestly not sure exactly what Obama wants to see in this healthcare bill, and I might not like his vision, but I’d sure as hell like to see him go with his gut and win or lose on the substance rather than the process. Priscilla, I have to say that you have a beautiful way to express your political thoughts. I wonder where were you for eight Bush years? I know that you’ll say that Bush was not a very good, or good, or average US President, but now I see a huge and blind resistance from *all* Republicans against a Democratic President, that was not so under Bush Administration. Actually Bush was only a stupid facade and special interests were working behind him. 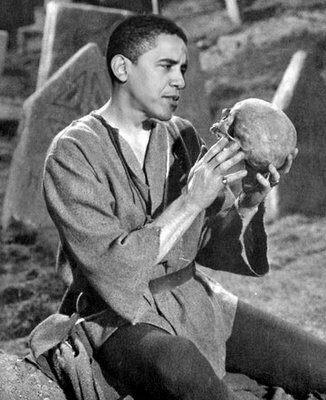 Now Obama tries to look like an articulate President and have his “big” step to overhaul the health care. This is a job that was tried before by Democrat Presidents with lack of enthusiasm from Republicans. For just one year as a US President, Obama is called Hitler, Stalin, and to be impeached. For me it is clear, it is not about politics but wealth power. A government usually has political power, and in many occasions it doesn’t work well with wealth power. That’s why wealthy class is trying to have a share in the political power. When it doesn’t work, there is a cry for “less government control”. At least Obama is trying to do something in the health care that was vaguely expressed even before him. He needs help, he got good intentions for people who cannot afford health insurance (you cannot deny that). The change is hard, when Obama tries to be decisive in these dark waters, Republicans cry “foul”, but they are not helping either (as usually they did before Obama). All I can see now to be done in the political arena, is to create as much confusion possible, say that the government is not the solution and give political power back to the wealthy class. They know that what they need is a small government that take care of the “defense” and spend tax money on arming and special interests, nothing for the plebeian class. As far as Bush and Obama and the name calling…..honestly, I think it’s just part of our national political style now, and has been greatly exacerbated by “pundits” on both sides, who actively encourage it and also by the internet, whcih allows people to say the most horrible things, yet remain anonymous and take no responsibility for their hate-mongering. I think much of the hatred for Bush was manufactured by the anti-war left, just as much of the hatred for Obama is manufactured by the far right. The difference, as I see it, is that media journalism has lost its objectivity and most newspapers and tv news stations report with a liberal slant. It amuses me when people hyperventilate over Fox’s conservative slant, as if that is some sort of evil perspective, when Fox just does what all the rest do, but maybe with a tad more openness (I also wonder if people who rail against Fox actually watch it – I watch all of the cable news stations, and I tbink MSNBC is by far the most biased and unbalanced in its programming and reporting). As far as Obama trying to fix the healthcare thing ….I do understand that you are saying that something has to be done, and he’s at least trying to do something. Andwe all think that something does have to be done, and that there is general agreement on that. But I think that the current bill proposed by the Democrats is seen by many to be far, far too costly and comes way too close to a government takeover of the system. Of course the GOP is against it, because they have not been allowed to participate in the process…..if there had been the usual compromise and consensus necessary to get a bill passed, there would have been at least a couple of Repubs voting yes….because the bill would have been modified with their input. But the Dems thought that they could do it without Republican support, because of their majorities, so they cut them out – and now, they’re battling among themselves and allowing the opposition to strengthen. When I say that Obam is indecisive, Iguess mean that he repeatedly says that doing “something” is better than doing “nothing”- when 1) no one is arguing that we should do nothing an d 2) screwing things up worse than they already are (which is what many think that this bill would do) is not better than anything. Afghan civilians dying from missiles could hardly be considered news. The Predator drone has been doing that for years. On a non-political subject, I’ve read that the RHIC has reached energy levels high enough to break down protons and neutrons. I’m interested to hear what you have to say about all the ion-collider paranoia that has been around recently. Especially because I’m kinda lost on the subject of American politics. Heh, thanks Knol. I think we might need some information on the subject of quantum mechanics before forming an opinion on that. I ahve plenty of time right now, so WARNING: WALL OF TEXT AHEAD. The most important topic is, by far, the Uncertainty Principle, which I do believe you’ve heard of already. Simply put, it states that it is impossible to know the velocity and position of a particle with 100% of certainty. This implies that all other data, such as total and potential energy and liner and angular momenta cannot, ever, be known with pure certainty. Skip the next paragraph if you don’t want to read on the details. Now this occurs because in order to measure or see something, what we do is hit it with light particles (photons) and observe the reaction. For instance, if no photons reach our eyes, everything is completely dark. On the other hand, if an object emits only photons at the red part of the spectrum, we see it as red. When we get down to the quantum-mechanical level, we see that particles actually absorb photons and shortly thereafter produce new ones according to their level of energy. Hitting a quantum with high-energy photons means we know its position more precisely (due to the shorter wavelength), but we affect its speed more strongly. Hitting it with low-energy photons means we don’t affect its speed as much but the data on the position is less precise. The only way we can “see” particles at the quantum-mechanical scale is to hit two of them at extremely high speeds and detect, by the resulting energy emissions, which particles were produced. Outside the experimental medium, it is possible to predict which particles will occur based on mind-blowingly complicated differential equations that take into account possible states of reality after measurements are taken. For a number of reasons, more energy means more detail, and that’s why massive structues such as the LHC exist. Right now, the LHC is being prepared to collide a few dozen particles of ionized lead (that is, lead that has lost electrons) together and produce a single Higgs boson, which has been dubbed “The God Particle” for the sole reason that without the Higgs boson, the entire mathematical framework that has been so widely used for over fifty years is WRONG. The Higgs boson has nothing to do with God. What it does is to completely fill spacetime so that particles are allowed to have mass (otherwise they wouldn’t). I’ll continue this on the next post if anyone is interested. Priscilla, regarding the health overhaul, I think that Democrats learned from the past experiences: Republicans say that want to participate the health care improvements, but they just linger until everything is forgotten and then go back to status-quo. It happened so many times before. By Participate, Republicans mean control, (which means; screw up) and if the Democrats had learned by now, they would have united to get something done. Shiroi, what can be known with certainty? 🙂 Maybe that if those scientists and mathmaticians are wrong, they’s gona be a whole lot of soul-crushingly (funny) awful despaor. Also, I wouldn’t want to have to redo 50 years of math. Carpal Tunel, ouch! Shiroi, all I know about quantum is that the Theory of Quantum states that nothing can be observed without changing the outcome. PS: How do you guys write these emoticons? I’m horrible at XHTML. Use the ; and : with the ( and ) to write the emoticons. Thanks. Well, while private space travel sounds like a good idea, there really aren’t that many options for traveling besides the Earth and the Moon. Take, for instance, Mars. On a direct route, which is more costly but also faster, traveling at 40,000 km/h means we arrive there in 58 days. At 10,000 km/h, which is much less expensive, it takes 232 days. With a more affordable budget, it can take more than three years to arrive. Anyone who spends more than 900 days or so in space has been affected by radiation so much that, upon arriving at Mars, tripping on a rock produces several fractures along the foot. 466 round trip cruise to Mars with one weekend on the Red Planet itself, only a billion dollars… It’s all in the sales pitch.